Sausage! One of my family's favorite food to grill and have for dinner because there are SO many different ways to enjoy it! You can grill them, serve them over pasta, pair them with veggies, have them as a sandwich! Now... the KEY is to find a sausage that is not only tasty but is also clean and preferably chicken. As a health and fitness coach, I want to feed my family only the best and I was pretty excited when I was asked to try Al Fresco's Sweet and Smokey BBQ sausages! 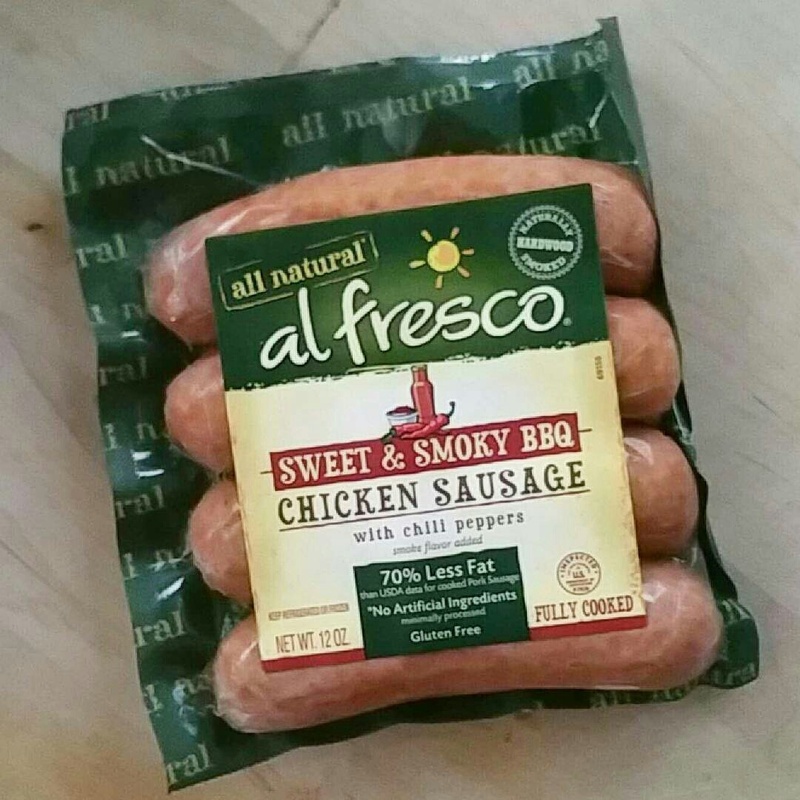 They are made with lean, skinless chicken meat, 30% less sodium than all pork sausage and gluten free! Plus they're already fully cooked so they're ideal for a quick and easy meal! When we have sausage, they're usually grilled on the BBQ, whether they're raw or fully cooked, because it gives them an extra yummy flavor, but when we had these, we just tossed them for a few minutes in a skillet and they were ready to eat! I've made them a few ways in the past week and below are two of the recipes that were a hit with the family! One is over salad and the other is over clean and healthy carbs! Slice the sausage and saute in a skillet for 3 to 5 minutes, then set aside. Add the spring mix salad blend (spinach, arugula, baby greens, etc) in a bowl. Add tomatoes, cucumbers and peppers. Add the sausage on top. Toss in balsamic vinegar, a hint of olive oil, lime juice and enjoy! 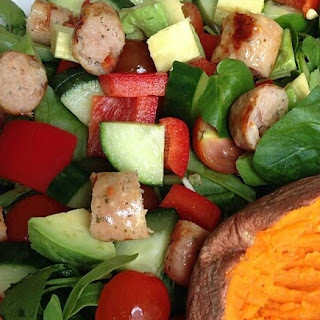 Pair with a baked sweet potato if you'd like to add some clean and healthy carbs to your meal! Slice the sausage add it to a skillet along with the chopped tomatoes. Saute the sausage and tomatoes in the skillet for 5 to 7 minutes. Remove and set aside. To make the spaghetti squash, slice the squash in half, take out the seeds and loose interior as you would a pumpkin, then place face down on a greased cookie sheet. Bake at 400 degrees for about 30 to 40 minutes. Let cool when done, then scrape out the "spaghetti" with a fork. Set aside. While the spaghetti squash is cooking, make your quinoa. Place the quinoa in a skillet with 1 part quinoa to 2 parts water. Bring it to a boil, cover and simmer until all liquid is absorbed. When done, set aside. After sausage, spaghetti squash and quinoa is done, it's time to make your dish! First place spaghetti squash on a plate. Top with some quinoa and blend slightly. 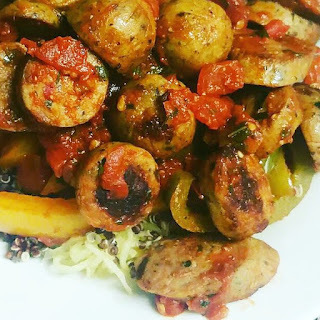 Then top with sausage and tomatoes, then serve and enjoy! These are just two of the many recipes you can enjoy with Al Fresco sausages! If you'd like to see more, head over to the Al Fresco Summer Sweepstakes and vote for your favorite one! You'll find lots of grilling recipes using the Sweet & Smokey BBQ variety I used above in my recipes and if you vote, you'll be entered to win $500 PLUS a high quality grill valued at $500 as well! If you have a recipe of your own, you can also enter it into the contest! Click HERE to see the recipes, vote and enter! Contest runs from June 20th through July 31, 2016. Those both look great!! I'd love to try the Summer Salad recipe! !